Common Name: Pilose antler, Pilose deer-horn, Pilose deer antler. Young pilose antler of male. Cornu Cervi Parvum is the young pilose antler of the male Cervus nippon Temminck or Cervus elaphus Linnaeus (Fam. Cervidae). 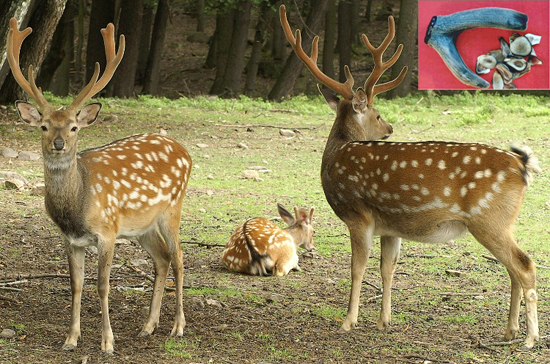 The former is known as Hua Lu Rong (sika deer pilose antler), the later known as Ma Lu Rong (red deer pilose antler). The horn is cut into slices or ground into powder for use. Functions: 1. To replenish blood and essence; 2. To tonify kidney yang; 3. To strengthen the bones and tendons. 1. Deficient kidney yang manifested as weakness of the body, aversion to cold, cold extremities, impotence in men, frigidity in women, infertility, frequent urination, soreness and pain in the lower back and knees, dizziness, tinnitus, gradual loss of hearing and listlessness. Pilose antler (Lurong) is used with Ginseng (Renshen), Prepared rehmannia root (Shudihuang) and Dadder seed (Tusizi). 2. Deficiency of blood and essence manifested as soreness and weakness of bones and tendons and infantile maldevelopment. Pilose antler (Lurong) is used with Prepared rehmannia root (Shudihuang), Dioscorea (Shanyao) and Dogwood fruit (Shanzhuyu). 3. Deficiency and cold in the Chong and Ren meridians manifested as white and dilute leukorrhea or uterine bleeding. Pilose antler (Lurong) is used with Donkey hide gelatin (Ejiao), Chinese angelica root (Danggui), Dogwood fruit (Shanzhuyu) and Cuttlefish bone (Wuzeigu). 4. Chronic ulcers. Pilose antler (Lurong) is used with Prepared rehmannia root (Shudihuang), Cinnamon bark (Rougui) and Astragalus root (Huangqi). 5. Cornu Cervi Parvum is used for deep-rooted carbuncles of a Yin nature or protracted ulcerations. Dosage: 1-3 g ground to a fine powder and administered three times a day, or used in pill form. Cautions & Contraindications: Cornu Cervi Parvum should be used in small dosages. It is contraindicated for those with hyperactive Yang due to Yin Deficiency, Blood Heat, Excessive Fire in Stomach, Phlegm Heat in the Lung, and epidemic febrile diseases caused by exopathogens.